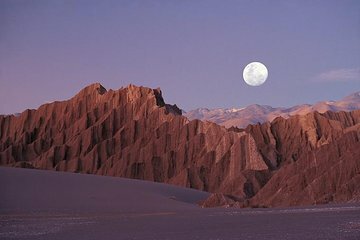 Marvel over the startling topography of Chile’s Valle de la Luna (Valley of the Moon) on this 4-hour afternoon tour from San Pedro de Atacama. Keep your camera close to hand as you journey through the desert, past unique rock formations and mesmerizing multi-hued cliffs. Discover the park’s geological wonders as you peek inside a salt cave, see natural landmarks like the Tres Marias statues, then watch the sunset from the top of the Great Dune. Perfect amount of time, beautiful sites, and the best tour guides of our entire trip! Pick up @ our hotel was right on time, bus was comfortable, and the views were tremendous. This tour does require a good amount of walking multiple stops, not all at once--nothing too strenuous, but you should be aware, and bring lots of water and sunscreen! Opportunities to do a few harder walks/climbs, but no one had to do anything beyond their comfort zone. The sunset has to be seen to be believed--amazing. This afternoon tour is a great way to explore Moon Valley. It has 4 stops in moon valley before the final sunset viewpoint. We got an opportunity to walk through caves, hike up a sand dune and visit death valley. Our guide, Pablo, was knowledgeable and friendly. The best part was the coffee and snacks at sunset point, which no other tour seemed to provide. Our evening was capped off with a gorgeous moonrise over the mountains. All in all, highly recommended. This is a good trip and worth doing. The Valley is beautiful and well worth visiting. Our guide Marco was excellent and very informative. The only shame with the afternoon only tour is we paid to go into the 'death valley' but did not get anytime to actually walk in to it as we had to make it in time for the sunset. I would suggest that the tour is slightly longer starting a bit earlier or for those who want to see the place more thoroughly - book on to a whole day tour as this is a whistle stop tour. Simply amazing. The landscape is breathtaking. This is a MUST DO for those staying in San Pedro. Our guide, Simon was superb. Except for the van without a functioning air conditioner, the rest was very good. Be prepared to walk and climb. The guide was very knowlegible in all matters and was very nice. In sum, a good tour, but the van was inexcusable! A very pleasant surprise. Expected much more low key sightseeing but enjoyed some great hiking too. Nice knowledgeable guide.